Optimize - Streamlined linear service software for pregnancy resource centers. Our comprehensive software system integrates scheduling, service processes, charts, database, reporting, and inventory management and is specifically designed to increase efficiency, boost credibility, and empower you to save more lives. Serve patients more effectively by implementing and evaluating targeted, life-saving enhancements quickly and easily. Work smarter and faster to better focus your time on serving patients. Increase trust with patients, donors, and the medical community. While it’s true that Optimize contains a database application, it is much more than that. As a medical process management software system, Optimize integrates every aspect of the patient services process and guides the user through it step by step, providing for real-time data entry. While Optimize does provide an electronic version of medical records, it is much more than that. Because data is entered directly into Optimize as your staff interacts with patients at every step, forms are signed electronically, and the software prompts actions and required steps, the medical record is created right within the software. This produces an accurate, consolidated, secure, and easy-to-access electronic record for each of your patients. The mission of every pregnancy center is to save pre-born lives. 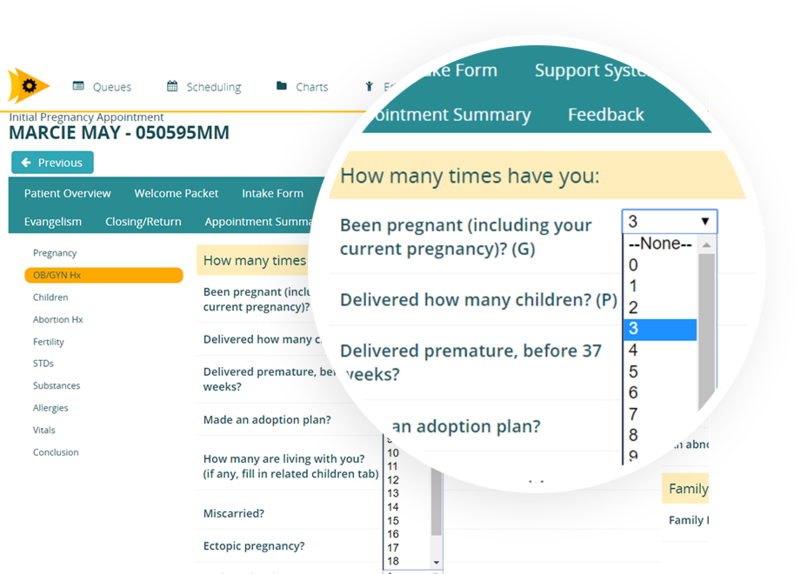 Optimize delivers tools and develops community to help pregnancy centers accomplish that mission more effectively and efficiently. Is Optimize Right for Us? Currently offer medical services such as ultrasound diagnosis of pregnancy, provided by licensed medical professionals. Demonstrate a commitment to improve and streamline services in order to become more efficient and effective in accomplishing your mission by defining measurable results and setting goals for improvement. Actively advertise to reach the target market: pregnant women at-risk for abortion. Willing to commit to participation in a Continuous Improvement Network with other PRCs using the Optimize software by attending quarterly meetings. Healthy Board-Executive relationship as well as a Board and Key Staff consensus on decision to transition to Optimize. At least one technically competent staff member to manage software implementation, staff training, and day-to-day software support activities. Completion of a Software Aptitude Assessment is required as part of the Optimize application process. Check out our free resource library for comprehensive PRC platform manuals, white papers, best-practice articles and FAQs. Optimize enables us to be relevant to the generation we serve... and to stay current with today’s expectations regarding health services. Eliminating paperwork is another HUGE benefit. Because it is an electronic system, there is no need to wait and do data entry...it is done as you go, reducing likelihood of error and streamlining the office. Optimize is super-efficient and very easy to use, substantially cutting down on our charting time. It allows us to more readily engage in crucial conversations rather than flipping through pages on a clip board during an exam. I can't imagine going back! Optimize is so user-friendly. We can easily look up and find information if a patient calls without running to find a chart. It's so nice to have our medical director sign electronically rather than hand-carrying charts to be signed. Optimize easily cuts our documentation time in half! The CompassCare team is quick to help with any issues or concerns we have. © 2019 Optimize. © Copyright CompassCare 2017. All Rights Reserved.